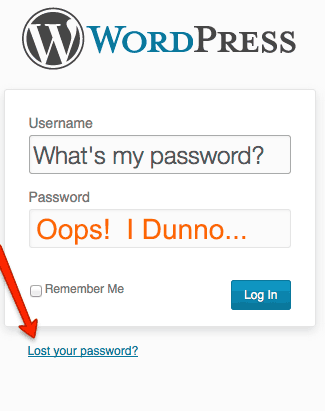 You’ve lost your WordPress administrator password, or worse, your web designer has flown the coup and you can’t log into your WordPress dashboard? It’s really not that hard to reset your password. I’ll explain with few easy examples below. Well, it is possible you are no longer set as the administrator, but click away. Enter every email address you believe you may have used into the Lost Your Password? box and submit. If all goes well you should receive a password reset link within seconds. Just remember to delete the file after use. Doh!